Once again, Texas overachieves at something bad. Even though mercury and other hazardous air pollution from U.S. power plants are declining, the progress at the coal-fired power plants are uneven, leaving in place a significant remaining risk to the health of the public and environment, according to a new report by the Environmental Integrity Project (EIP). Coal-burning power plants release millions of pounds of toxic pollutants into the air every year, including mercury and carcinogens like arsenic and chromium. US EPA’s Toxics Release Inventory (TRI) can be used to identify the largest sources of these dangerous pollutants based on annual reports the electric power industry submits to the Agency under federal Right to Know laws. Mercury is a potent neurotoxin, especially harmful to developing fetuses and young children. Available online at http://environmentalintegrity.org/news_reports/01_03_2013.php, the new EIP report uses TRI data for 2011 (the most recent full year available) to identify the 10 largest sources of power plant mercury emissions – five of these are in Texas, of which four are owned by Luminant Generation. EIP Attorney Ilan Levin said: “Nationwide, equipment has been installed over the years to reduce emissions of sulfur dioxide and particulate matter. That has helped cut down on the release of mercury, toxic metals and acid gases from power plants over the last ten years. However, that progress is uneven, and the dirtiest plants continue to churn out thousands of pounds of toxins that can be hazardous to human health even in small concentrations. For example, emissions of mercury from coal-fired power plants have actually increased in the last decade in the state of Texas. You would think, given his deep and abiding love for fetuses, that Rick Perry would be all over this. You would, of course, be wrong. The full report is here; note that not only does Texas have five of the top ten, we have four of the top five. And as the report notes, the news just keeps getting better. Fortunately, mercury emissions from coal-fired electric power plants have declined over the past decade, from 88,650 pounds in 2001 to 53,140 pounds in 2011. 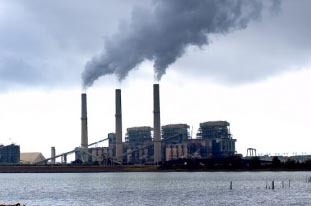 States like Maryland have cut mercury emissions from coal plants at least 80 percent through tough new state standards, while reductions in other states are a byproduct of pollution controls installed to meet other federal standards. For example, scrubbers that reduce sulfur dioxide to comply with acid rain or fine particle standards will also remove mercury. These reductions have not been evenly distributed; for example, mercury emissions from Texas power plants have actually increased since 2001. That matters, because rivers and lakes closest to power plants are the most likely to be the hardest hit by power plant mercury pollution. The EPA’s long-delayed Mercury and Air Toxics (“MATS”) rule, which gives power plants until February of 2015 to comply, would level the playing field by requiring the industry’s laggards to catch up with companies that have already cleaned up their plants. EPA estimates that the rule will cut annual power plant mercury emissions to just over 13,000 pounds by 2016, about 75 percent below current levels. But the rule is being fiercely challenged by Luminant and other companies seeking to avoid the cost of the pollution controls needed to meet the new standard. Yes, they are fighting it fiercely. See here, here, and here for some background. After that story about the connection between lead contamination and crime rates, we should all be very, very afraid of anything that dumps large quantities of heavy metals into our air, water, and soil. There is one bit of genuine good news in all of this, and that is that the proposed White Stallion coal plant has been cancelled, and with the boom of natural gas there’s no new coal-burning plants on the horizon. That won’t do anything to help mitigate the effects of the plants we have now, but at least it won’t get any worse.